Discussion in 'Celebrity Extra' started by SophieK81, Apr 15, 2019 at 10:59 AM. 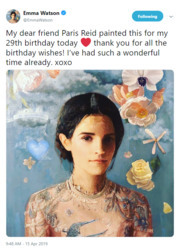 Emma Watson 29th Birthday Portrait from a friend. amraith62, Sonicboom, physicalintheory and 9 others like this. Little 'Miss Thing' on the train is now 29. Where did the time go? Sonicboom and jones1351 like this. 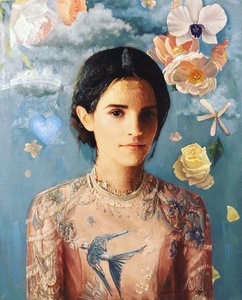 Happy Birthday Emma, and the next year we would appreciate one portrait à la Rose de Witt. Hard to believe it's been 11 years since we saw her bush. As I was already kinda old, when she rode the express... I'm truly creaky now.